A concept, a customer, and a cellar. That was all Charles Longley needed to found New England Door Closer, one of the nation’s foremost door hardware authorities. The year was 1946. IBM introduced the first electronic calculator, Ethel Merman knocked them dead on Broadway in ‘Annie Get Your Gun’ and the world mourned the passage of writer, visionary H.G. Wells. Longley, a transplanted Vermonter, began picking up door closers at Western Massachusetts A&P stores, taking them home to his basement and putting them back in working order. It was really just a way of supplementing lost income while on strike from his position with Westinghouse. But as word spread of Longley’s stellar service and budget prices, his customer base began to grow. He bid Westinghouse adieu and concentrated his full efforts on the new venture. He even made a bold move out of his cellar— into the cellar of A.W. Gifford Locksmiths in Springfield. Like New England Door Closer, Gifford stands tall to this day. But even that cellar was too confining to hold Longley’s burgeoning business. He eventually took over his own storefront on Main Street in West Springfield and began adding employees at a rapid pace. A New England Door Closer sales and service representative could expect to sit behind the wheel of their brand new 1952 Pontiac Sedan Delivery and pick up, drop off and install closers from Bangor, Maine to Syracuse, New York and every point in between. Longley's leadership and the high caliber of his staff earned him flagship accounts such as S.S Kresge, W. T. Grant and Woolworth. Defective closers were brought back to the small Main Street shop where they were disassembled and cleaned in a special ‘degreaser’— the only machine Longley owned. The growing technical staff carefully re-assembled each one, replacing all broken or worn parts with factory originals…same as today. With his business growing as fast as his reputation, Longley relocated to Union Street in the mid 50’s and built New England Door Closer into a giant. The nation’s leading door closer manufacturers LCN, Corbin, Russwin, Yale, Rixson and many others beat a path to his door in hopes of getting him to sell, service and promote their products. Longley only dealt with the finest because his personal guarantee went out the door with each unit. Longley cruised into the 70’s with eldest son Nelson by his side. 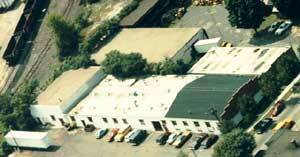 New England Door Closer was now truly a family business and continued growing. But each life and every business endures adversity and tragedy. In a family operation, it takes on a new meaning and deeper sorrow. Nelson died suddenly in 1976 and for the first time, the future of New England Door Closer was uncertain. But the incredible strength of a family business is family itself. Ron Longley, Charlie’s youngest son, had already settled in Minnesota and was exploring his own business opportunities when he pulled up stakes and headed back to New England. He took Nelson’s place at his father’s side and New England Door Closer steamed forward once again. 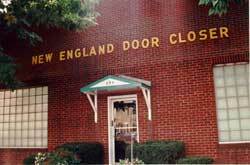 Ron eventually became president of New England Door Closer. Throughout the reckless spending and overnight sensations of the 80’s, he kept the company on its true course without compromising the ethical foundation his father built it on. Charles passed away in 1987 but his legacy and reputation live on. Ron’s children, Deanna, Adam and Jared have since joined the company ensuring it’s family future. How does a business last so long? How does it thrive through adversity? What is the key? For New England Door Closer it all comes down the foundation laid by Charles Longley—a frugal Vermont yankee who always kept his word. A word that’s still good 50 years and two generations later.